Why does color have meaning? What are those meanings? And how does color influence our perception and behavior? Welcome to a huge resource on color psychology. 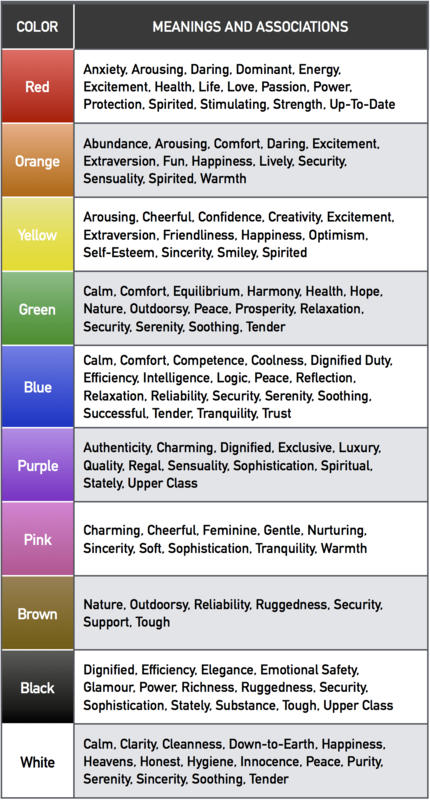 If you’re only interested in color meanings, you can skip to this table. However, this article explores color psychology in much greater detail — with many other applications. PDF Bonus: This article is 6,528 words. Click to download the full PDF so that you can reference it later. Until now, most information has been plagued with pseudoscience (i.e., pure anecdotal hooey). To rectify those inaccuracies, I dug through 50 academic studies on color. In the end, I found some pretty interesting — yet credible — findings. I summarized my findings in the following table (click the image to enlarge it). Next time you’re choosing a color, use the chart below to guide your decision. But that table is only scratching the surface. The rest of this article is divided into three parts. 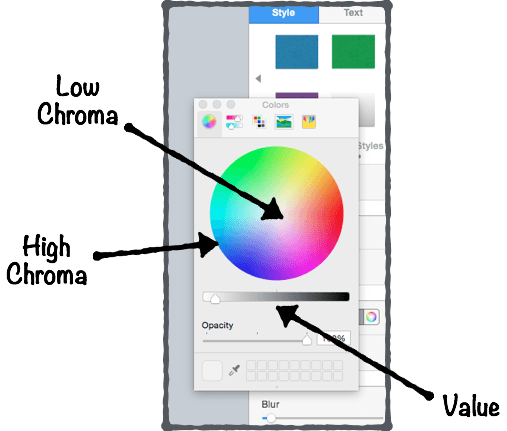 1.1 | What Are the Components of a Color? 1.2 | Why Do We Prefer Certain Colors? 1.3 | How Do Colors Get Their Meaning? 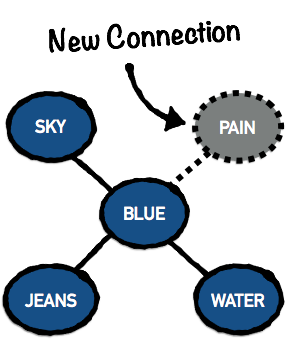 1.4 | Why Do Colors Have Different Meanings? 1.5 | What Does Each Color Mean? 1.6 | Why Does Color Influence Us? 1.7 | What Makes a “Good” Color? That information won’t be immediately actionable. But it will set a foundation for the practical suggestions in the next two parts. In Part 3: Putting It All Together, you’ll learn how to integrate the information from both parts into a cohesive strategy. 3.2 | How Many Colors Should You Choose? 3.3 | Which Colors Go Well Together? 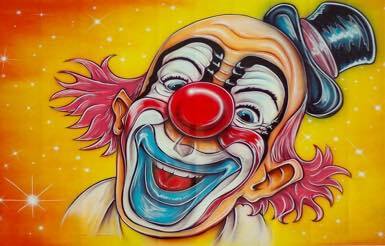 Open your eyes, and everything around you is radiating with color — blue, red, yellow, green — the list never ends. We’re engulfed in color. With such a pervasive topic, a ton of research must exist, right? 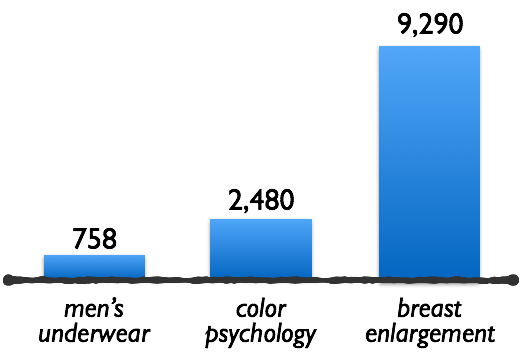 Color psychology is on the same level as men’s underwear. After scouring the handful of studies available, I pieced together a model depicting the psychological effects of color. I call it the Kolenda Color Model (alas, I chose the narcissistic naming route). By the end of Part 1, you’ll understand all of those pieces. What Are the Components of a Color? In order to understand the foundation of that model, you need to understand the components that comprise the visual nature of color. But those colors look different. Why is that? 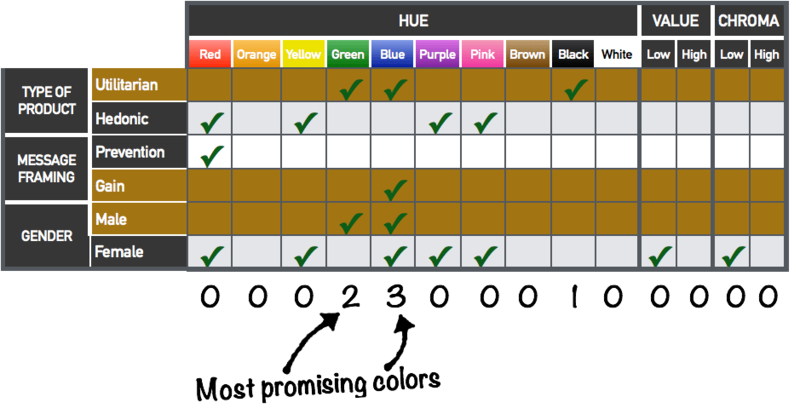 Hue is the overall color name. Most marketers focus entirely on hue. And that’s a mistake. Research shows that the next two components play a larger role in emotional impact (Suk & Irtel, 2009). Value is the level of brightness. How light or dark is a color? Colors with low value are darker (called “shades”). Chroma is the level of saturation. How vivid is the color? Across the globe, blue is the “favorite color” of most people (Valdez & Mehrabian, 1994). But why is that? And why is it uncommon to prefer black, gray, or brown? Where do those preferences originate? We develop color preferences based on innate biological mechanisms — largely emerging from evolution. That’s also why males prefer blue, whereas females prefer pink. Researchers argue that those differences emerged from an evolutionary bias grounded in a hunter-gatherer mindset (Hurlbert & Ling, 2007). 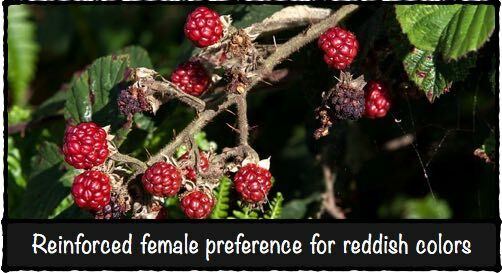 In other words, female brains developed a preference for reddish colors because of their ancestral duties in gathering food sources. Is it far-fetched? Possibly. Evolution definitely plays a role in the arousal reaction to color (explained later). But in terms of color preferences, the next two theories offer a more promising explanation. When our children are young, we reinforce gender stereotypes. Because children feel a need to conform to their gender, males become drawn to blue, whereas females become drawn to pink. In one study, researchers analyzed different aged children (ranging from 7 months to 5 years old). They wanted to study their preference for pink over time. The result? As children grew older, girls became increasingly attracted to pink, whereas boys became increasingly distant of pink (LoBue & Deloache, 2011). Their preferences evolved as they learned more information about their gender. The previous theories can explain some color preferences. But those explanations are limited. For example, why do people prefer different variations of a hue, such as light blue vs. dark blue? Since we all possess the same biological composition — more or less — shouldn’t we share the same color preferences? Why do differences emerge? 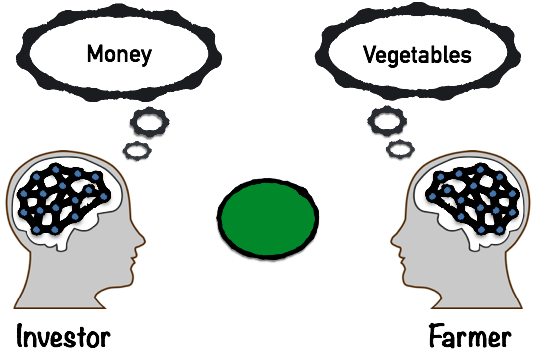 Ecological valence theory (EVT) can explain those differences (Palmer & Schloss, 2010). According to that theory, we develop preferences for colors, based on our emotional experiences with those colors over time. Classical conditioning supports that notion. In one study, a researcher paired different colored pens with pleasant or unpleasant music. At the end of the experiment, participants were more likely to take home a colored pen that was paired with pleasant music (Gorn, 1982). From a young age, children attach positive emotions to those respective colors. 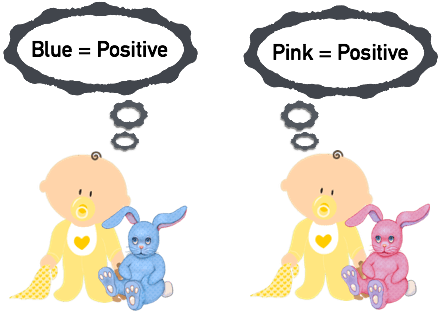 Males attach positive emotions to blue, whereas females attach positive emotions to pink. Those positive emotions, in turn, dictate their color preferences. How Do Colors Get Their Meaning? Ecological valence can explain the emotional impact of colors. But how do colors acquire semantic meaning? Why do we associate red with passion and romance? Or why do we associate black with mourning? 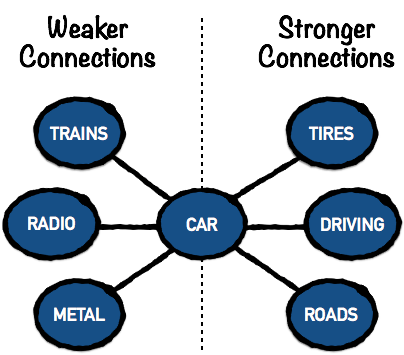 The answer lies in associative network theory (Bower, 1981). 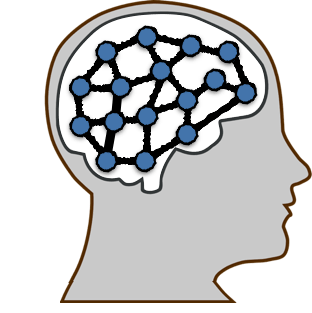 Our brain contains an associative network — an interconnected web of knowledge. Those nodes are connected to other nodes, based on the degree of similarity between them. Stronger similarities generate stronger connections. Throughout your life, you’re constantly growing your associative network. With each new experience, you (a) create new nodes (b) form new connections, or (c) strengthen existing connections. That’s great, Nick. But how does that relate to color? Your brain contains a node for each color. Each time you encounter a color, you modify that node based on your experience. You can make that adjustment consciously or subconsciously. Either way, you’ll attribute a new meaning to the color blue. That new association, in turn, can influence your perception and behavior. How? We’ll revisit that answer later, so keep this concept in mind (pun intended). Why Do Colors Have Different Meanings? Let’s address a common myth. Too many psychology “gurus” attach specific meanings to specific colors. Don’t get me wrong — those associations are correct. And we’ll go over those meanings in a later section. But color psychology isn’t that simple. Black: Funeral directors develop a stronger association between black and mourning. If they see black in a different context, it could trigger feelings of death and sadness. Yellow: Custodians develop a stronger association between yellow and urine. If they see yellow in a different context, it could trigger feelings of disgust. White: Frequent skiers develop a stronger association between white and exhilaration. You get the idea. Even though most people possess those same associations, the intensity of those connections will depend on past experience. Always consider your target market before choosing a color scheme. Do those people have frequent experience with a particular color? If so, is that association helpful or harmful? This article can’t address all cultural differences (I’ll be focusing on color meanings in the Western world). However, if you expand internationally, you’ll need to research culture-specific colors before you (a) distribute your product or (b) create marketing campaigns targeted toward specific ethnicities. Certain colors might possess harmful meanings in that culture. Red is another example. In a dating context, red elicits feelings of passion and attraction. 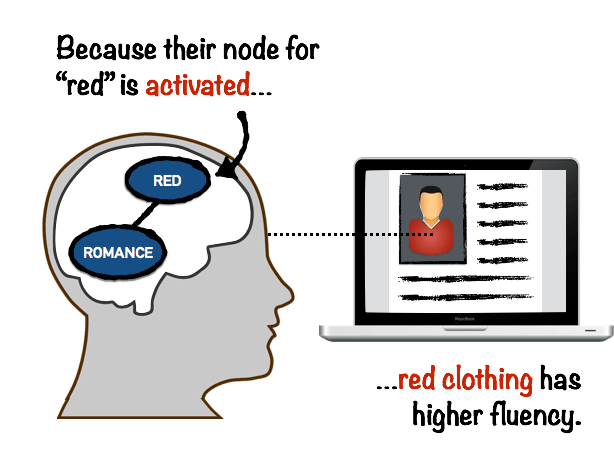 That’s why women find men to be more attractive in online dating if those men are wearing red in their picture (Elliot et al., 2010). However, red holds different meanings elsewhere. In achievement contexts, we associate red with failure — partly due to the frequent use of red pens in grading. And that’s why people perform worse on achievement tasks (e.g., IQ tests) after being exposed to the color red (Elliot et al., 2007). Past experience, culture, and context are a few factors that determine the meaning of a color. But despite those varying factors, people generally share a similar set of meanings. We’ll discuss those meanings next. In a few paragraphs, I’ll present a chart of all color meanings. These meanings were compiled from a multitude of academic studies. How did the researchers derive those meanings? For most studies, researchers asked participants to rate certain colors on various dimensions. For example, Labrecque (2010) presented participants with different colored logos. Participants were then asked to evaluate that logo on various factors relating to personality and likability. All of the following traits have emerged through similar methodologies. So hopefully these color meanings will be more accurate than the commentary you’ll find elsewhere. I excluded citations for the sake of clarity. But if you want to see the academic studies comprising this table, you can refer to Table 3.2 in Labrecque (2010). I wanted to include that table because some of you will be looking for that information. However, don’t place too much weight on it. So don’t rely entirely on the information in that table. Instead, use the suggestions in the next two parts of this article. Those applications incorporate value and chroma, so the information will be more accurate. Why Does Color Influence Us? We know that colors possess certain meanings. But why (and how) does color influence our perception and behavior? Arousal is a physiological state, characterized by higher adrenaline, blood pressure, and heart rate. You feel more activated. When you’re exposed to warm colors (e.g., red, orange), you experience an immediate biological reaction. Your adrenaline starts flowing. Your blood pressure rises. You experience a greater sense of stimulation. 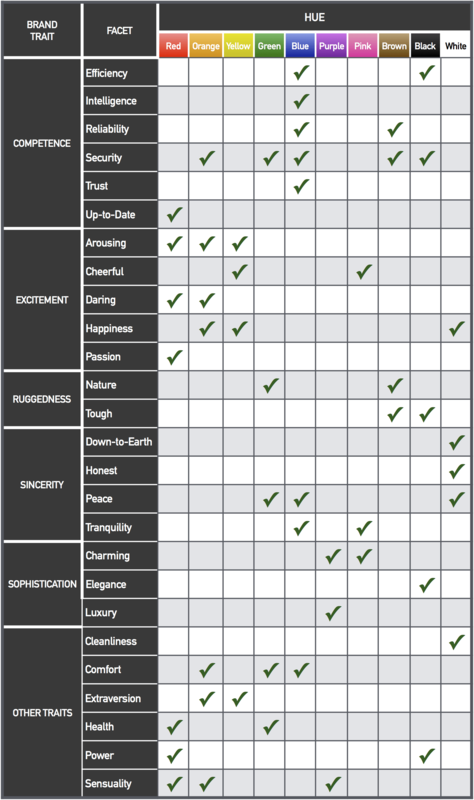 Depending on your marketing goals, higher arousal can either help or hurt you. And we’ll discuss those situations later. 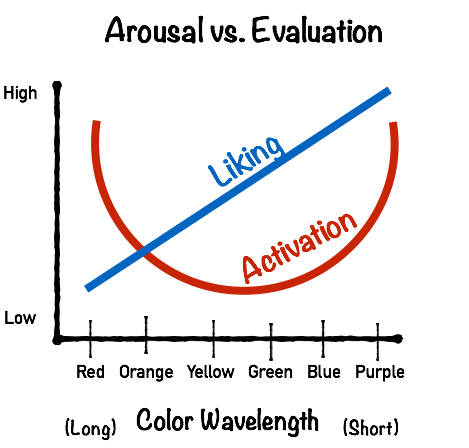 In addition to arousal, the other reaction is evaluative: do consumers “like” your choice of color? Crowley (1993) found a positive linear trend between evaluation and color wavelength. People tend to “like” colors with shorter wavelengths. So let’s integrate that finding with the previous graph. But here’s a question: why does color produce an evaluative reaction? The answer involves your associative network. Whenever you’re exposed to a color, your node for that color becomes activated. Once that node becomes activated, it triggers spreading activation (Collins & Loftus, 1975). Activation spreads to all of the nodes that are connected to it. When those surrounding nodes become activated, all of those concepts become temporarily integrated in your perception of the world. So let’s apply that insight to color. Earlier I mentioned that women find men to be more attractive if those men are wearing red (Elliot et al., 2010). Why does that happen? There are two mechanisms at play. Regardless, once the “red” node becomes activated, women can temporarily identify red stimuli more quickly and easily. And that’s the key. If a woman sees a man wearing a red shirt, she’ll be able to process the picture more easily. That increased processing fluency generates a pleasant sensation in her brain. Because she feels good processing the man’s picture, she falsely infers that he is more attractive (see Alter & Oppenheimer, 2009). So that’s one mechanism. But the influence also works in reverse. If women are exposed to the color red, activation spreads to all surrounding nodes — including their node for passion and romance. Once the “romance” node becomes activated, women temporarily perceive stimuli to be more congruent with passion and romance. So they’ll perceive a man’s picture to be more attractive. But in terms of color psychology, the underlying concept is important to grasp. Most people assume that the visual nature of color is important. But that’s not the case. Research shows that merely thinking about a color can produce the same effect as visually perceiving it. In one study, thinking about the color yellow produced the same neurological changes —activation of the left fusiform gyrus — as did visually seeing the color yellow (Simmons et al., 2007). That means exposing people to written colors (e.g., the word “yellow”) can produce corresponding changes in perception and behavior (Lichtenfeld et al., 2009). If you understand spreading activation, that finding make sense. Colors are influential because of our conceptual knowledge. Hues are almost meaningless. Color meanings (and their subsequent influence) depend on the emotional and semantic meanings that we associate with a color. However, one piece of the puzzle still remains. 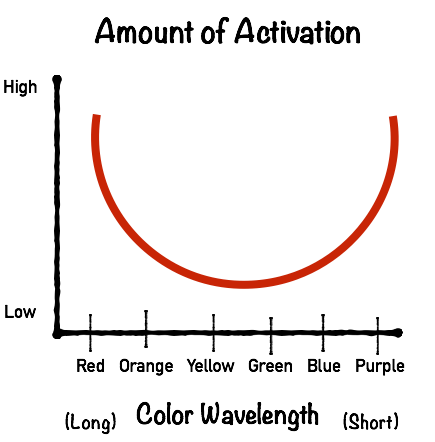 What factors influence our evaluation of a color? In other words, what makes our evaluation positive or negative? We’ll discuss those factors next. What Makes a “Good” Color? Marketers often choose colors based on preferences — i.e., the colors that people prefer. However, that’s usually the wrong approach. You need to consider the appropriateness of a color. For example, most people prefer blue to brown. But suppose that you’re buying a table. What color would you want? Most people would choose brown because it seems more appropriate. Colors need to be appropriate on two dimensions: emotion and semantic meaning. For example, people often choose to paint the walls of their home based on the emotion that they want to feel in that room (Schloss, Strauss, & 2012). 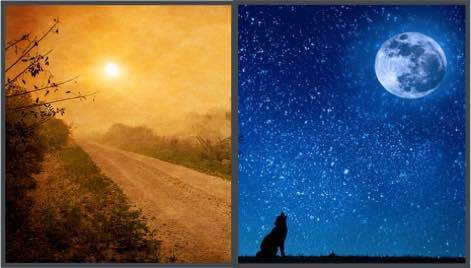 This article has focused on associations and color meanings. But you can’t ignore aesthetics. Never choose a color solely based on its emotional or semantic meaning. At the end of the day, your product or design needs to be visually appealing. That’s why color psychology will never be a formulaic science — and rightly so. The third factor is value. And it has two components: social and functional. 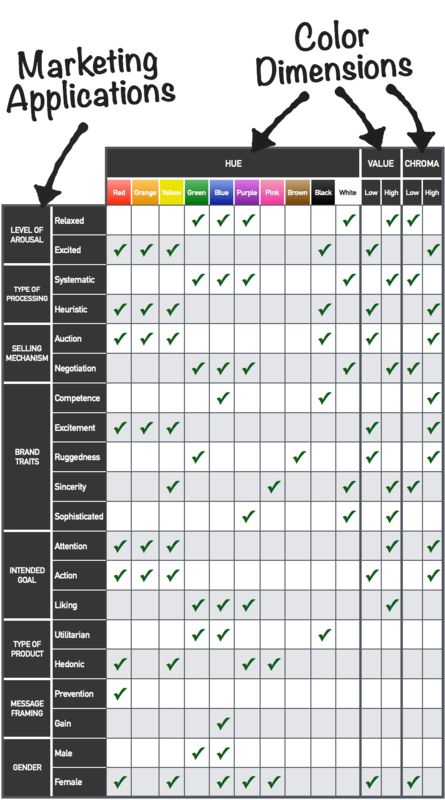 In terms of social value — is your color useful from a social standpoint? 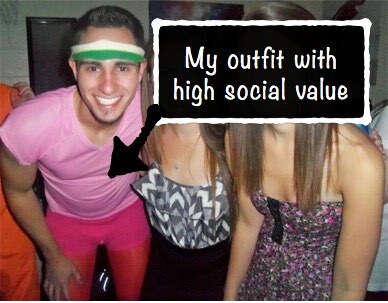 For example, certain clothing styles are “in fashion” (and would have high social value). 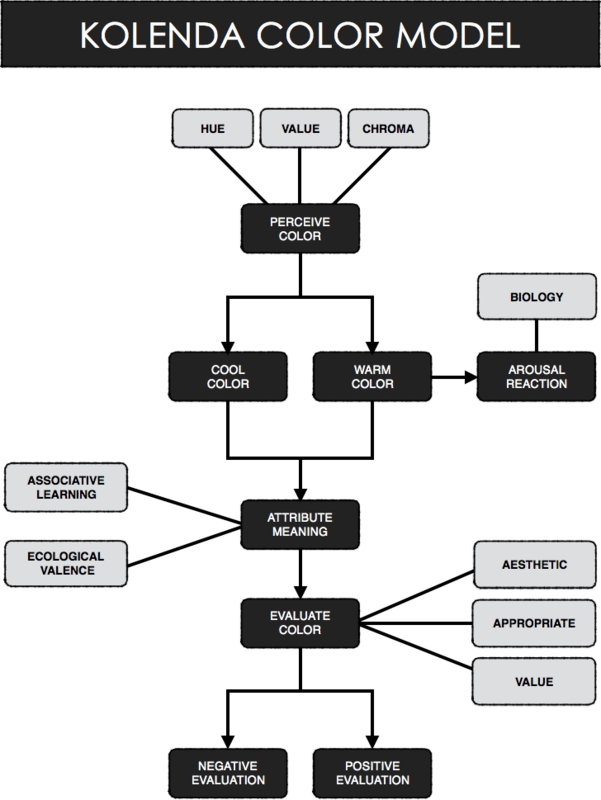 In terms of functional value — is your color useful from a pragmatic standpoint? For example, silver cars can hide dirt and scratches. So silver would have high functional value. Black cars — because they accentuate dirt and scratches — would have low functional value. Now that you understand the theory and science behind color, the Kolenda Color Model might make more sense. You can refer to that model if you want to remind yourself how potential customers might evaluate your color choice. However, that model doesn’t specify which colors will help you. So that’s what you’ll learn in Part 2. In the previous part, I traced the steps that determine someone’s evaluation of a color. In this part, I’ll explain the table that I presented at the beginning of the article. I’ll break down each section of that table so that you’ll know how to choose the best color(s) for specific marketing applications. But when should you increase vs. decrease arousal? This section will explain. For example, people who were afraid of spiders reported a longer time duration in the presence of a spider (Watts & Sharrock, 1984). In another study, people reported a longer time duration when they made eye contact with someone scowling (Thayer & Schiff, 1975). 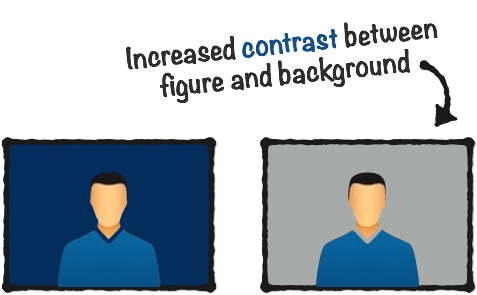 Because of that effect, cool colors reduce perceived loading times on websites (Gorn et al., 2004). Arousal increases impulsivity because it inhibits cortical functioning (Walley & Weiden, 1973). People spend less much time rationalizing or debating, and they’re more likely to act now. So if you want someone to make an immediate decision, increase their arousal through warm colors. Because arousal reduces rational thinking, you can use that insight for another marketing application. 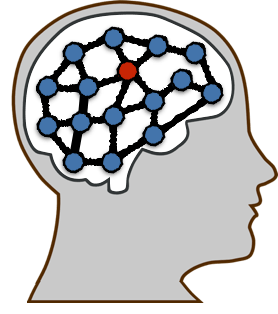 If your arguments are weak, you’ll want people to use heuristic processing. So use warm colors to increase their arousal (so that you decrease cortical functioning). If your arguments are strong, you’ll want people to use systematic processing. So use cool colors to decrease their arousal. Arousal also plays a role in some of the other marketing applications that we’ll discuss — especially the next one. Color plays a role in two different sales mediums: auctions and negotiations. In one study, researchers analyzed background colors of eBay auctions. Oddly, they found that red backgrounds generated more revenue (Bagchi & Cheema, 2013). Do you know why? Hint: it involves arousal. Give up? Red increases arousal, which triggers more aggression. Those aggressive tendencies influence people to keep bidding so that they outbid their competition. If you sell products through negotiation, you’ll want to use the opposite colors. Since you are the competition, use cool colors to reduce their aggression. Even small factors — like clothing — can make a difference. Researchers analyzed penalty data in the NFL and NHL, and they found that teams with black uniforms received more penalties (Frank & Gilovich, 1988). You might want to wear blue to your next job interview. And if you want more negotiation tactics, you can refer to my negotiation article. Most marketers use color to convey the personality of their brand. Whenever you want to convey a certain trait, you can use the table above to pinpoint a suitable color. But what if you want to convey traits that are more specific? Depending on your situation, oftentimes you’ll be trying to accomplish a specific goal. This section will explain how color can help you achieve three distinct goals: attention, action, and liking. Sometimes you want color to capture people’s attention. Will your product stand out on retail shelves? Will people notice your image in social media? Will people notice the CTA button on your page? Kawasaki and Yamaguchi (2011) exposed people to various colors, and they studied their brains through an EEG. When a favorite color was present in the background, their brains became activated before they consciously noticed it. Color subconsciously captures our attention. But how can you capture that attention? Some studies suggest using warm colors (e.g., Garber, 2000). However, as I mentioned in this CRO article, the best solution is usually contrast. Your attention is naturally guided toward stimuli that are visually salient (Parkhust, Law, & Niebur, 2002). 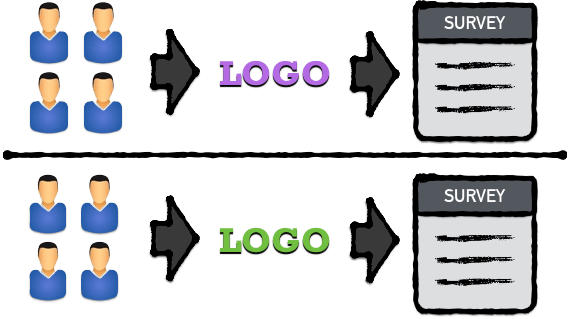 If you want to guide attention toward a stimulus (e.g., a CTA button), choose a color that contrasts with the surrounding environment. Sometimes you want color to trigger behavioral responses — whether it’s buying your product, sharing your content, or subscribing to your blog. To achieve that goal, use colors that increase arousal, such as warm colors with high saturation and low brightness. Because those colors trigger impulsivity, they tend to increase behavioral responses. Since you’re deep into this article, I hope that you’re enjoying it. To stay updated on new articles, you can subscribe to my blog. In doing so, you’ll gain access to a PDF of this article (and a few other surprises). In another study, Bakhshi and Gilbert (2015) analyzed sharing data for 1 million Pinterest images. The results? People were more likely to share images that contained warm colors (e.g., red, pink), and they were less likely to share images that contained cool colors (e.g., blue, green). The heightened activation may have sparked a greater impulse to share. Sometimes you want color to trigger a favorable impression of your product or brand. You also might want to consider using brighter colors, such as whites and light greys (Valdez & Mehrabian, 1994). Which type of product do you have? Bottomley and Doyle (2006) examined the role of color in those product classes. They surveyed a sample of people to determine the colors that people associate with functional vs. social-sensory benefits. In the study, people developed a stronger affinity toward products when colors were congruent with the product. Functional colors enhanced utilitarian products. Social-sensory colors enhanced hedonic products. Prevention: Which problems will your product prevent? 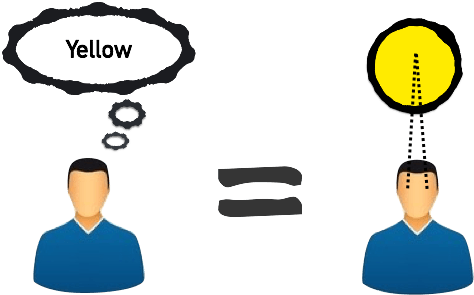 Gain: Which benefits will your product provide? Certain colors can enhance those frames. As I explained in this advertising article, we usually associate red with avoidance. Because of that association, red activates an avoidance mindset. With that mindset activated, people identify problems more quickly. Red activated an avoidance mindset, and it enhanced the appeal of the prevention advertisement. 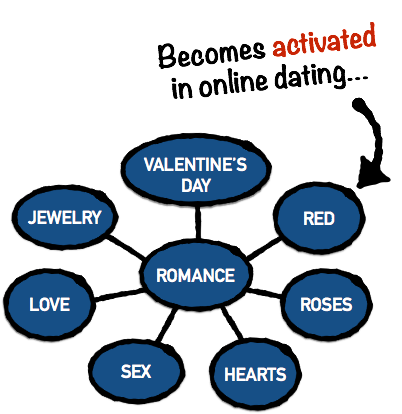 Blue activated an approach mindset, and it enhanced the appeal of the gain advertisement. Evolution: Females were the gatherer. So they developed the ability to identify red and yellow food sources (Alexander, 2003). 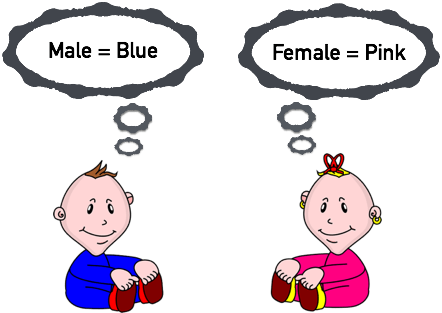 Gender Schema: From a young age, males are guided toward blue, whereas females are guided toward pink (LoBue & Deloache, 2011). Ecological Valence: Based on our experience, we attach positive emotions to certain colors (Palmer & Schloss, 2010). Other studies have found that males prefer high value and high saturation, whereas females prefer low value and low saturation (Radeloff, 1990). This article has covered a ton of ground. So let’s fit the pieces together. Now that you have a clearer understanding of the marketing applications, let’s walk through an example using the large table that I presented at the beginning of the article. Suppose that you’re using a gain frame to sell a utilitarian product to a male demographic. You could follow these steps. Step 1: Highlight all rows that fit your situation. The image above is just a snippet from the full table. You could also highlight rows in other sections of the table as well. But if a section isn’t relevant, you can skip it. Step 2: At the bottom of each column, tally the number of highlighted checkmarks. Step 3: Look for the highest scoring colors. Use those high scores to guide your color choice. If you need to choose a single color, the highest scoring color might be your best bet. How Many Colors Should You Choose? In this article you learned the semantic meanings of each color. However, the sheer number of colors can also convey semantic meaning. So how many colors should you choose? First, you should consider your product — whether it’s utilitarian or hedonic. A small variety of color conveys utilitarian and serious qualities, whereas a large variety conveys hedonic and fun qualities (Bottomley & Doyle, 2006). I guess more colors can convey uncomfortable creepiness too. We all possess a finite amount of processing resources. That’s why you need to consider the amount of content vying for the observer’s attention. Suppose that you’re designing an advertisement. If your ad contains a lot of text, consumers will need to devote more processing resources to evaluate your ad. And that can be problematic if your design contains a lot of color. Colors require processing resources too. So if your ad contains a lot of content and a lot of color, your design becomes overwhelming. Research suggests that people will develop a worse impression of your product. Which Colors Go Well Together? How do people evaluate a stimulus containing multiple colors? Which colors, when combined, look visually appealing? Schloss and Palmer (2011) ran multiple studies and found that one factor influences all three components: the relationship between the foreground and background. Obviously you can break those guidelines. But that insight can help you choose a color scheme — as you’ll see next. Now that you understand the components of an aesthetically pleasing color scheme, how can you choose the right combination of colors? Monochromatic color schemes use different variations of the same hue. Because of its simplistic nature, monochromatic color schemes are useful in communicating simple messages or conveying a sophisticated brand (Rider, 2009). Also, because the variations are similar, you should consider using a monochromatic scheme when choosing colors in the same plane (see the previous section). Analogous color schemes use similar hues in close proximity on the color wheel. Like monochromatic designs, analogous color schemes can increase the perceived harmony of your design because of the similarity in hue. So consider using this approach when choosing colors in the same plane. Triadic color schemes use three colors situated at 120 degrees on the color wheel. Complementary color schemes use colors on opposing sides of the color wheel. Because they fall on opposite sides of the color wheel, complementary colors have high contrast. Use that insight to your advantage. If you want to increase contrast between the foreground and background, choose a complementary color. Or you can choose a complementary color if you want to push attention toward some element (e.g., CTA button). 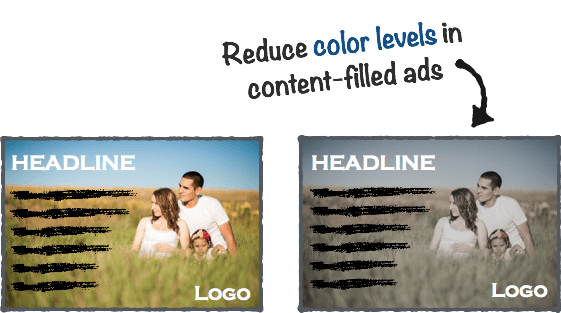 By choosing a color that contrasts with the surrounding content, you’ll naturally guide attention toward it. If you’ve read my other articles, you’ll know that I enjoy cramming as much content down your throat as possible. And this article was no different. However, I think it was needed. Color psychology is a fascinating topic — yet it’s plagued with so many inaccuracies. I’m sure this article has flaws too. But I’m hoping it’s a step in the right direction. Bonus: Click to download the 64pg PDF + checklist so that you can reference it later. You’ll also get access to my other PDFs and videos. Before departing, I want to leave you with two main takeaways. Marketers often choose colors arbitrarily. But not you anymore. Now that you understand the science and psychology of color, you can now strategically analyze your color choices. Next time you choose a color, you can reference the models above to determine (a) how certain colors will influence observers, and (b) which colors will create your desired perception and behavior. 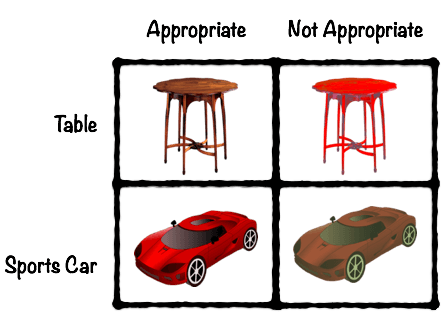 Although I gave you a table containing specific recommendations, you could argue that those suggestions are useless. Within graphic design, no strict rules will ever exist. In fact, the best designs often break the rules. So you’ll always need a human. You’ll always need creativity. Color psychology will always be an art form. But I hope that you learned some useful insights nonetheless. If you want to stay up-to-date on new articles, you can subscribe to my blog. I’ll try to make each article worth your time.